To celebrate the Middle East swing Your Golf Travel has partnered with Etihad Airways, one of the world's largest airlines. This fantastic partnership offers incredible flight deals to Abu Dhabi including free golf club carriage. Book Now and take advantage of great savings that will also see you also enjoy an excellent flight service on board, including an impressive entertainment system and delicious dining options. Stay tuned to Your Golf Travel to find out more about exclusive deals with Etihad Airways. We are extremely proud to announce a new partnership with Etihad Airways! All flights include FREE golf bag allowance up to 15kg and included Luggage allowance from 23kg. Etihad Airways, voted the World's Leading Airline for eight consecutive years at the World Travel Awards* is committed to making sure that every time guests fly, their journey is truly remarkable. With constant innovation and re-thinking the small things that make big differences to the way guests fly. Etihad continues to reimagine flying, with a pioneering spirit and traditions of hospitality, drawn from their home Abu Dhabi, to create contemporary living spaces in the air and deliver unparalled comfort and service. Etihad offers daily flights from the UK to Abu Dhabi. There are three daily departures from London Heathrow and two daily departures from Manchester, you can then fly onwards to over 100 destinations. Whether you choose to travel in first, business or economy class, you will experience the newest aircraft, latest entertainment systems and finest onboard dining. Imagine a place where your customers can relax in total comfort, enjoy the best inflight entertainment, sample a selection of fine international cuisine, and experience warm Arabian hospitality. Welcome to Etihad's Economy Class. 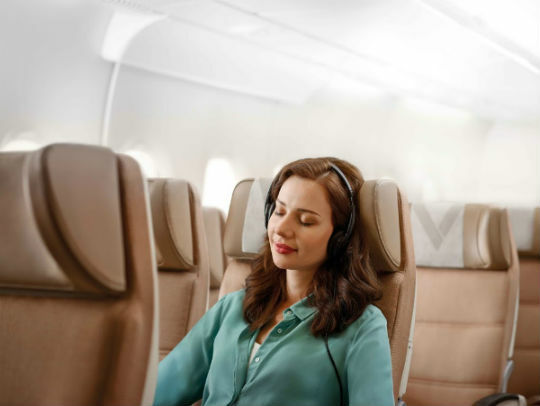 In Economy Class, Etihad have introduced new elements that will make guests' journey a more relaxing one. Cabins are refreshed with a new range of pillows and blankets. On longer flights, Etihad offer a unique pillow that converts to a neck pillow to help guests sleep. Relax and enjoy hundreds of hours of on-demand movies, music, shows, and seven Live TV channels on your personal touch-screen TV. Further benefits include the introduction of a blanket bag that doubles up as a convenient tidy bag to store personal belongings, all combined with new amenity kits and enhanced food and beverage offering. The Business Class experience has been designed to give guests even greater levels of comfort and choice. Relax on guarantee a fully-flat bed with direct aisle access on every long-haul flight. 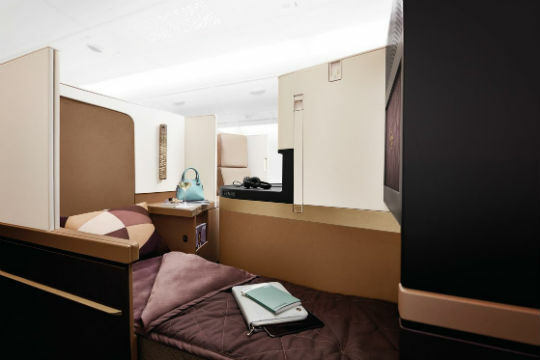 Etihad Business Class seats converts to a fully-flat bed of up to 6 feet giving you plenty of space to stretch out. Freshen up using your exclusive designer amenity kit featuring carefully selected skincare products. Watch hundreds of hours of inflight entertainment on a 15-inch touch-screen TV and enjoy the in-seat massage facility plus adjustable headrest, footrest, back support and cushion firmness. On long-haul flights a Food & Beverage Manager is on board to guide you through the menu and take your order when you want to eat.